All EDS K-5 students enjoy participating in a new school-wide Art in Action Program in our fabulous art studio! The Art in Action Program is a “discipline-based, sequential art curriculum designed around the works of the great masters.” Each lesson is begins with looking at a masterpiece, and ends with a student project. Students study the masterpiece in a guided discussion, learning about the artist, the style, and the principles of art. Then students create their own original art, reinforcing the concepts and techniques learned from the masterpiece. The program is aligned with California and National Visual Arts Standards and integrates with other elements of the core curriculum. Art in Action is taught by parent volunteers and classroom teachers who are trained by the experts from the Art in Action program. Each year, the EDS Showcase and Young Author’s Faire takes place in the spring. 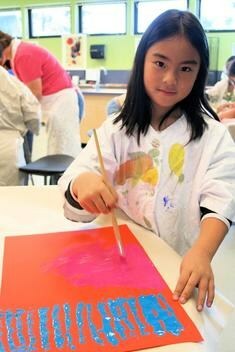 Here, each and every students has a chance to display his or her art masterpieces.